One of the best-kept ingredients in America can be found in the fertile swamplands of the South. Alligator is quickly becoming a prized ingredient in restaurants throughout the country, but battling these flavorful reptiles at home can be a bit of an uphill battle. You may find all the information you need in our selection of Frequently Asked Questions. What part of an alligator do you eat? In some parts of the country, people eat and use the entire alligator. However, the most commonly eaten parts of any alligator are the ribs and the tenderloin. Gator ribs are usually treated just like pork spare ribs, and they can be baked, grilled, or smoked. Gator tenderloin encompasses the inner piece of the tail, and each tail has two tenderloins. Gator tenderloin is considered by many to be the “filet mignon” of alligator meat. White tail meat is another desirable part. How long does alligator meat last? Shelf life depends entirely on how recently the alligator was caught. Alligator meat is usually sold as frozen pieces or fillets. Meat should always be firm with a fresh aroma and no discoloration. You should safely store thawed alligator meat in the coldest part of your refrigerator for up to two days. Alternatively, you can freeze tightly wrapped meat for up to six months. 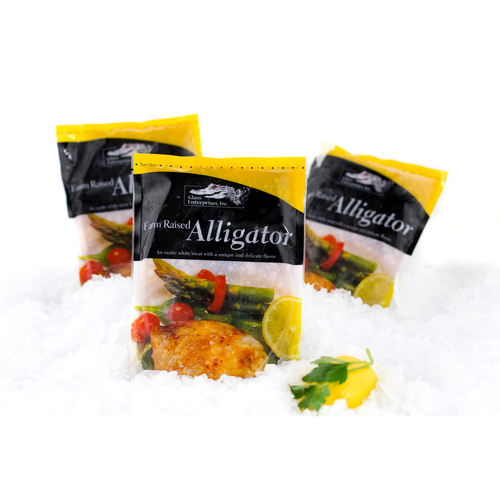 Before cooking, you should thaw any frozen alligator meat in the refrigerator overnight. How do I cook alligator meat? Three of the most popular methods of cooking alligator ribs are baking, grilling, or smoking. Before you start, you can marinate your alligator ribs with flavors you and your guests find most appealing. When baking, it is important to wrap the ribs in foil, because they are lean and can dry out. Barbecuing over medium heat will result in tender gator ribs. Alligator tenderloin can be deep-fried, pan-fried, or seared quickly with high heat or slowly by simmering in a sauce, stewing, or braising. Gator tenderloin can easily replace chicken, pork, veal, or fish in most of your favorite recipes. What goes well with alligator meat? Some people claim that alligator meat tastes just like chicken, but its texture and taste can better compare to that of veal, fish, or something in between. Due to its mild taste, alligator meat goes well with a wide variety of foods and ingredients. Some people serve alligator just as they would ham, in thin slices and served with a creamy dressing, jam, or pickled vegetables. Others prefer their alligator meat slow-cooked and shredded on a nice brioche bun. Fans of chicken wings will love alligator nuggets, especially when served with a side of dipping sauce. Try your alligator meat with a side of chili garlic mayonnaise, sauce piquant, sautéed peppers, picadillo, or chili. Can’t find the answer to your question? Contact Wholey’s today for further assistance.